Throughout the first half of the 20th Century knitted garments had developed from primarily (but not invariably) functional items of underwear, hosiery, sports and work wear, to fashionable informal daywear inspired by innovative designers such as Coco Chanel and Jean Patou. 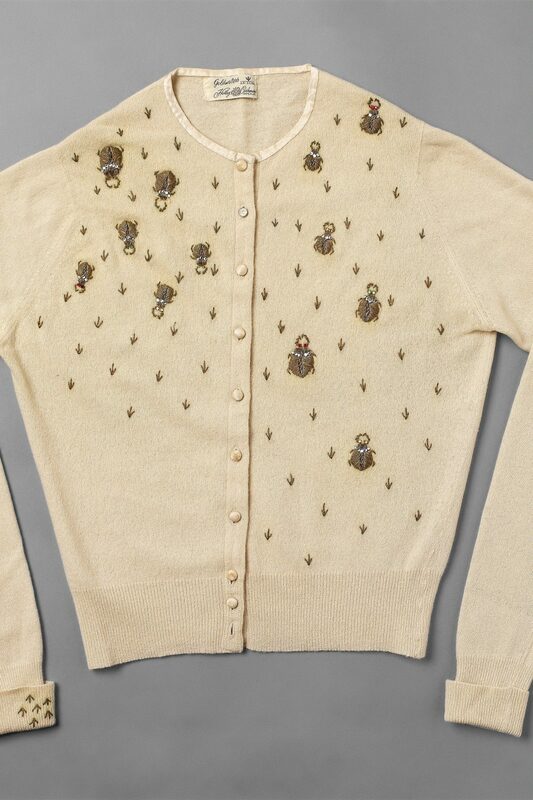 After the Second World War, knitwear became established as evening wear in the form of elegant cardigans and jerseys, made from luxurious fibres, ornately trimmed, or embroidered with beads, sequins and metallic thread. Teamed with smart dresses or skirts they became de rigueur for cocktail parties and all but the most formal of evening events. 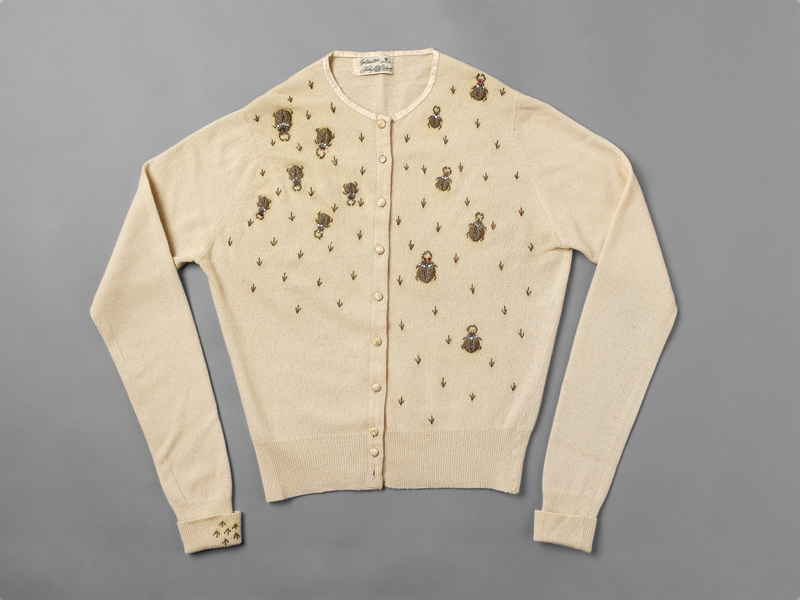 This example was made by Hadley, one of the main manufacturers of cashmere knitwear in the United States, and a competitor to traditional Scottish firms like Pringle and Lyle & Scott whose knitwear was popular in America. Hadley specialised in supplying department stores such as Goldwaters of Arizona, and capitalised further by producing coordinating skirts and blouses. 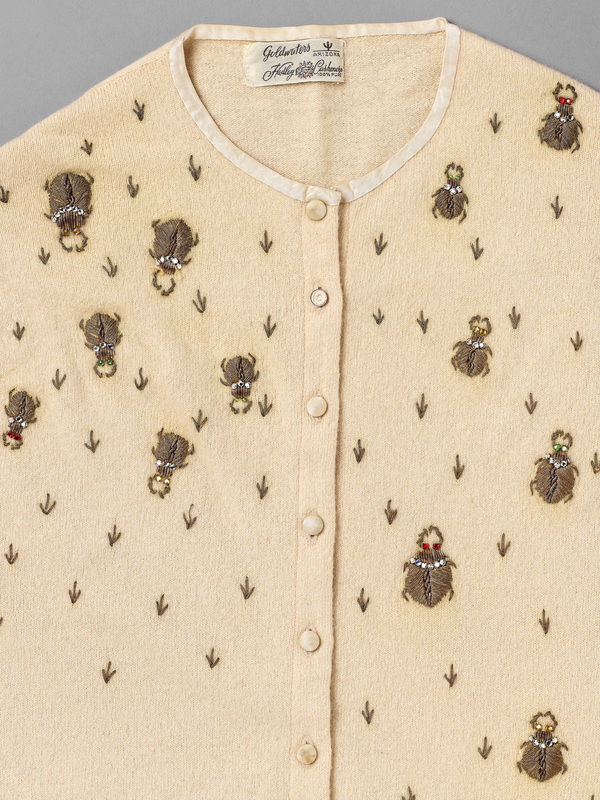 Many cocktail cardigans were extremely encrusted with decoration- this one is sophisticated in its restrained design of asymmetrically-placed scarab beetles of various sizes, Hadley frequently featuring unusual and light-hearted motifs. A silk lining was a usual additional touch of luxury; however, Goldwaters may have requested this design to be unlined to suit the warm climate of Arizona.